This rich fish pie has a topping of grated potato and sweet potato instead of mash. Peel the potatoes but leave whole. Boil in a pan of water for about 8-10 minutes until almost tender then drain and cool in cold water. Meanwhile place the haddock or cod and salmon in a saucepan and just cover with cold water. Heat to a gentle simmer and poach for a few minutes until just cooked. Lift out and cool on a plate. Measure 200ml of the poaching liquid into a jug and discard the rest. Make the sauce. Pour the poaching liquid and milk into a saucepan and add the butter, flour and stock powder. Bring slowly to the boil, whisking all the time until thickened and smooth then turn off the heat. Add the cream, peas and parsley then stir and place on the lid to keep warm. Grate the potatoes into a bowl, stir in the melted butter and season with salt and pepper. 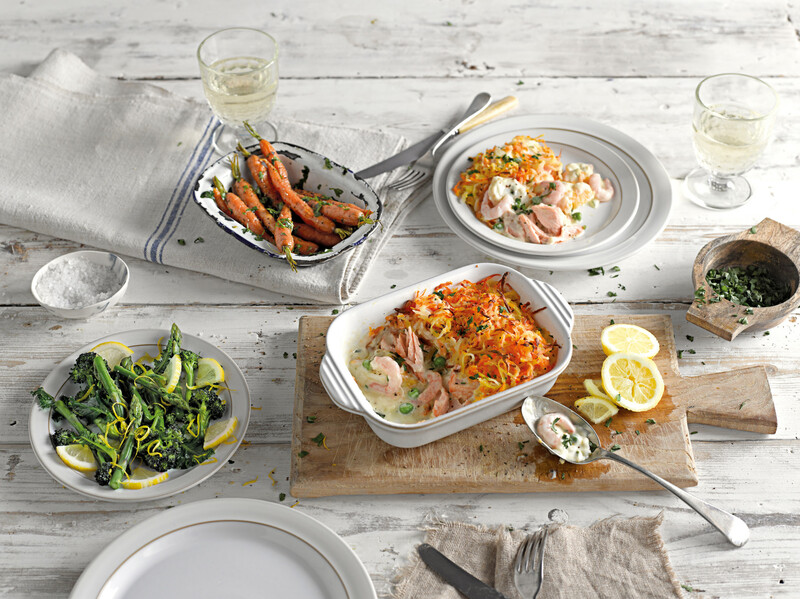 Assemble the pie by dividing the fish and prawns between the Denby small rectangular dishes. Pour over the sauce then spoon on the grated potato topping. Sprinkle over the cheddar cheese, if using and bake for about 25 minutes until golden and bubbling. Serve with lemon wedges, steamed green vegetables and roasted baby carrots on the side.